Rajat S Roy, Dana C Price, Alexander Schliep, Guohong Cai, Anton Korobeynikov, Hwan Su Yoon, Eun Chan Yang, Debashish Bhattacharya. Single cell genome analysis of an uncultured heterotrophic stramenopile. Scientific Reports 4 (2014), 4780. R Cameron Coates, Sheila Podell, Anton Korobeynikov, Alla Lapidus, Pavel Pevzner, David H Sherman, Eric E Allen, Lena Gerwick, William H Gerwick. Characterization of Cyanobacterial Hydrocarbon Composition and Distribution of Biosynthetic Pathways. PloS one 9(1) (2014), e85140. Sergey Nurk, Anton Bankevich, Dmitry Antipov, Alexey A Gurevich, Anton Korobeynikov, Alla Lapidus, Andrey D Prjibelski, Alexey Pyshkin, Alexander Sirotkin, Yakov Sirotkin, Ramunas Stepanauskas, Scott R Clingenpeel, Tanja Woyke, Jeffrey S Mclean, Roger Lasken, Glenn Tesler, Max A Alekseyev, Pavel A Pevzner. Assembling single-cell genomes and mini-metagenomes from chimeric MDA products. Journal of Computational Biology 20(10) (2013), pp. 714-737. Jeffrey S McLean, Mary-Jane Lombardo, Jonathan H Badger, Anna Edlund, Mark Novotny, Joyclyn Yee-Greenbaum, Nikolay Vyahhi, Adam P Hall, Youngik Yang, Christopher L Dupont, Michael G Ziegler, Hamidreza Chitsaz, Andrew E Allen, Shibu Yooseph, Glenn Tesler, Pavel A Pevzner, Robert M Friedman, Kenneth H Nealson, J Craig Venter, Roger S Lasken. Candidate phylum TM6 genome recovered from a hospital sink biofilm provides genomic insights into this uncultivated phylum. PNAS 110(26), pp E2390-E2399. Jeffrey S McLean, Mary-Jane Lombardo, Michael G Ziegler, Mark Novotny, Joyclyn Yee-Greenbaum, Jonathan H Badger, Glenn Tesler, Sergey Nurk, Valery Lesin, Daniel Brami, Adam P Hall, Anna Edlund, Lisa Z Allen, Scott Durkin, Sharon Reed, Francesca Torriani, Kenneth H Nealson, Pavel A Pevzner, Robert Friedman, J Craig Venter, Roger S Lasken. Genome of the pathogen Porphyromonas gingivalis recovered from a biofilm in a hospital sink using a high-throughput single-cell genomics platform. Genome Research 23(5), pp. 867-877. Yana Safonova, Alexey Kondrashov, Maria Logacheva, Aleksey Penin, Anton Bankevich: NGS assembly of highly polymorphic diploid genomes. Dmitry Antipov, Ksenia Krasheninnikova, and Pavel A. Pevzner: using uneven coverage depth in bacterial single-cell repeat resolution. Alexey Gurevich, Vlad Saveliev, Nikolay Vyahhi, and Glenn Tesler: quality assessment of genome assemblies (web tool). Yakov Sirotkin. Visualization of the MS-Align algorithm results for the protein spectrum matches (demo). Sergey Nikolenko. Hammer 2.0: Bayesian error correction for non-uniform coverage (talk). Max Alekseyev. Challenges in Comparative Genomics: from biological problems to combinatorial algorithms (and back) (talk). Pavel Pevzner. De novo sequencing of peptide antibiotics (talk). Max Alekseyev, Pavel Pevzner. The Birth and Death of Fragile Regions in Human Genome (highlight track paper). Mikhail Dvorkin, Alexander Kulikov, Max Alekseyev. Earmark Graph Approach to de novo genome assembly (poster). Sergey Nikolenko, Max Alekseyev, Pavel Pevzner. 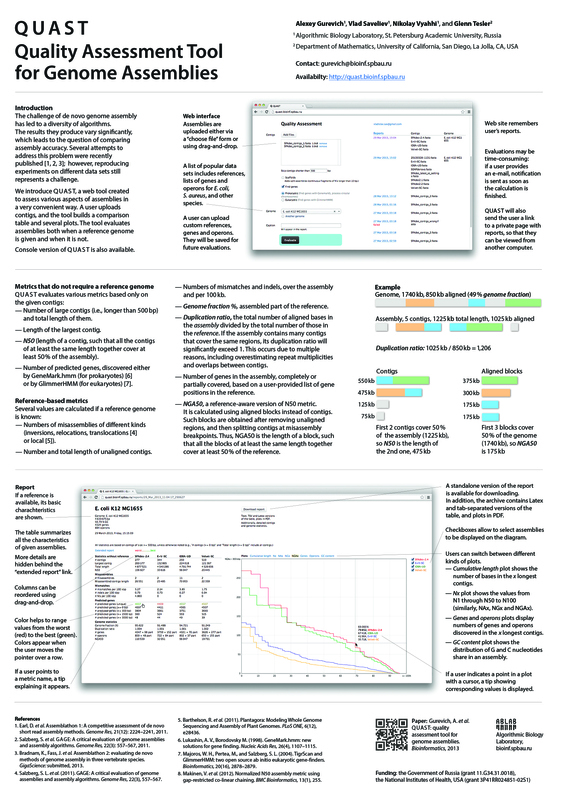 Bayesian Evaluation of de novo Genome Assembly (poster). Nikolay Vyahhi, Sergey Nurk, Anton Bankevich, Max Alekseyev, Pavel Pevzner. Expandable de novo genome assembler for short-read sequence data (HiTSeq poster). Xiaowen Liu, Yakov Sirotkin, Yufeng Shen, Gordon Anderson, Yihsuan S. Tsai, Ying S. Ting, David R. Goodlett, Richard D. Smith, Vineet Bafna, Pavel A. Pevzner. Protein Identification Using Top-Down Spectra (poster).